(1) SFWA IN A TENT. The Science Fiction and Fantasy Writers of America had a tent at this year’s Baltimore Book Festival. Here’s some highlights. (2) OVERTIME. William Patrick Maynard tells how “Phileas Fogg Finds Immortality” at Black Gate. When Jules Verne created gentleman adventurer Phileas Fogg in his 1873 novel, Around the World in Eighty Days, he had no way of imagining the bizarre turn his character’s chronicles would take a century later. When Philip Jose Farmer added The Other Log of Phileas Fogg to his Wold Newton Family series in 1973, he had no way of imagining that four decades later there would exist a Wold Newton specialty publisher to continue the esoteric literary exploits of some of the last two centuries’ most fantastic characters. (3) HOW THIS YEAR’S HUGO BASES WERE MADE. Read artist Sara Felix’s Facebook post about creating the bases. And there’s an Instagram from the company that did the fabrication. (4) HUGO LOSER DIFFERENT FROM JUST PLAIN LOSER. The Vancouver Sun ran an article on Sebastian de Castell, with a Puppyish spin on events, “The time George R.R. Martin called Vancouver writer Sebastien de Castell a loser”. It was nothing personal, though. In fact, it had little to do with de Castell at all. 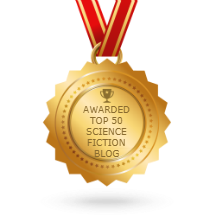 De Castell was at the annual celebration of science fiction and fantasy writing/fandom because he had made the Hugo shortlist for best new writer. De Castell figured he would lose to Andy Weir of The Martian fame — he was correct in this prediction — and he assumed Martin believed the same thing. But Martin was also reacting to the fact that de Castell had been nominated in part because of the efforts of two fan voting blocs: the Sad Puppies and Rabid Puppies. The Puppies groups have caused chaos in the Hugo Awards and the broader sci-fi and fantasy communities lately by trying to fight what they see as the takeover of the awards by “social justice warriors” who vote for politically correct works at the expense of good writing and storytelling. Both the Sad Puppies, created by bestselling author Larry Correia, and the Rabid Puppies, launched by right-wing writer Vox Day, have put forward slates of suggested writers and works to vote for, and de Castell wound up on just such a list much to his surprise. That’s what Peter and I were discussing in that portion of the interview–the gap for me between feeling like a “big time author” and coming face-to-face with the reality of being a guy who’s really still very much in the early stages of his career. The most interesting thing about WorldCon (MidAmericon II) for me was how kind people were to me overall. I was very cognizant that my presence on the Campbell shortlist was controversial and likely painful to a lot of people within that community. They had every reason to suspicious and even dismissive of me, but in fact folks were generous and welcoming. David Gerrold gave me some excellent advice on completing the final book in the Greatcoats series, Alyssa Wong was terrific and fun to hang out with (we were the only two Campbell nominees in attendance so our official photos got pretty silly), and I got to spend some time chatting with the brilliant Michael Swanwick. (5) DC EXPLORING 2024 WORLDCON BID. Their polished website suggests a group that is doing more than just thinking about it, however, they say DC in 2024 is still in the exploratory stage. We are members of the Baltimore-Washington Area Worldcon Association, Inc. (BWAWA). In 2013, we launched DC17, a bid to host the 2017 Worldcon in Washington, DC at the Marriott Wardman Park hotel… but we lost to Worldcon 75. We’re back to explore the possibility of hosting the 82nd Worldcon in 2024. Washington, DC is still a super location for a World Science Fiction Convention and we believe it’s time Worldcon returned to DC for the third time. The year 2024 will be the 50th anniversary of Discon II, the last DC Worldcon. We are still very early in the planning stage. Please check back for information on supporting our bid and our future activities. Our social media links are also still under construction. They’re exploring right now – but I expect they’ll find they’re bidding if they keeping looking. (6) WEINBERG OBIT. SF Site News reports Robert Weinberg (1946-2016) passed away today. Author Robert Weinberg (b.1946) died on September 25. Weinberg began publishing fiction in 1967 and from 1970 to 1981 edited the fanzine Pulp about pulp magazines. He wrote for Marvel Comics and was known for his art collection. Weinberg also ran a mail order book business until 1997. Weinberg received a special committee award at Chicon 7, the 2012 Worldcon. Here is the citation that was read at Chicon 7 when Weinberg was presented with his Special Committee Award. Each year, the Worldcon committee is entitled to recognize someone who has made a difference in our community. Someone who has made science fiction fandom a better place. This can be a fan, an author, a bookseller, a collector, a con-runner, or someone who fits into all those and more. This year, Chicon 7 is pleased to recognize someone who fits into all of those categories. Robert Weinberg attended his first meeting of the Eastern SF Association in 1963, discovered the club offered something he liked, and became active, eventually becoming the club’s president in 1968. Maintaining an interest in the pulp magazines which formed so much of the basis for what we read today, Bob published fourteen issues of the fanzine, Pulp, from 1974 through 1980. In 1968, Bob began publishing readers guides to the works of H.P. Lovecraft and Robert E. Howard, eventually expanding both to book length and publishing additional guides and books about the pulp magazines and the authors who wrote for them. 1973 saw his publication of WT50, an anniversary tribute to Weird Tales, a magazine to which Bob would acquire the rights in 1979 and help revive. Bob is a collector of science fiction and fantasy art from the 40s, 50s, and 60s, working to preserve art which otherwise might have been lost. His interest in art collection also led to him writing A Biographical Dictionary of SF & Fantasy Artists, which served as a basis for Chicon 7’s Guest of Honor Jane Frank’s own A Biographical Dictionary of 20th Century Science Fiction and Fantasy Artists. Beginning in 1976, Bob began serving as the co-chairman of the Chicago Comicon, then the second largest comic book convention in the United States. He continued in that position for twenty years before it was sold to Wizard Entertainment. During that time, Bob also chaired the World Fantasy Convention when it came to Chicago on two different occasions and in 1978 he co-chaired the first major Doctor Who convention in the United States. Bob has also written his own books, both non-fiction and fiction.. His first novel, The Devil’s Auction, was published in 1988 with more than a dozen novels and collections to follow. He worked with Martin H. Greenberg to edit and publish numerous anthologies beginning in the 1980s. Not content to write his own books and monographs, run conventions, and collect art, Bob also, for several years, ran the mail-order Weinberg Books. Bob offered advice to Alice Bentley when she was setting up The Stars Our Destination, a science fiction specialty bookstore in Chicago from 1988 through 2003. In 1997, Bob sold his mail order business to Alice. Bob’s long career as a fan, author, bookseller, collector, and con-runner has helped make science fiction the genre, and the community, it is today. Chicon 7 would like to recognize Robert Weinberg for his years of service and devotion given to advancing the field of science fiction, fantasy, and horror. Robert Constant Peterson passed away on August 15 after a brief illness. He is survived by his four sons, John, James, Alan, and Douglas, and his grandchildren, Katherine, Eric, Diana, and Jay. Robert was preceded in death by his wife of over 50 years, Winifred. Robert graduated in 1942 from the University of Wyoming and served in the U.S. Army during World War II. He was an avid hiker and was an active member of the Colorado Mountain Club. He led hikes for the club until just before he turned 80. He met his wife, Winifred, on a mountain club hike. Robert was an early fan of science fiction. In 1994 he was elected to the First Fandom Hall of Fame, and in 2008 he received the Sam Moskowitz Archive Award in recognition of his SF collection. Robert and Winifred were lifelong members of the Washington Park United Church of Christ and were strong supporters of social justice. They supported Winifred’s sister Gretchen in her work at the Asian Rural Institute (ARI) in Japan. Robert and Winifred travelled extensively in the U.S. and throughout the world. In lieu of flowers contributions can be made to the American Friends of the ARI (http://www.friends-ari.org/). (8) GARMAN OBIT. Jack Garman (1944-2016), credited with a judgment call that saved the first moon landing, died September 20 at the age of 72. The alarm appeared to indicate a computer systems overload, raising the specter of a breakdown. With only a few minutes left before touchdown on the moon, Steve Bales, the guidance officer in mission control, had to make a decision: Let the module continue to descend, or abort the mission and send the module rocketing back to the command ship, Columbia. By intercom, Mr. Bales quickly consulted Jack Garman, a 24-year-old engineer who was overseeing the software support group from a back-room console. Mr. Garman had painstakingly prepared himself for just this contingency — the possibility of a false alarm. Mr. Garman, whose self-assurance and honed judgment effectively saved mankind’s first lunar landing, died on Tuesday outside Houston. He was 72. His wife, Susan, said the cause was complications of bone marrow cancer. September 25, 1959 — Hammer’s The Mummy, seen for the first time in the UK on this day. (11) JUST BEFORE THE FINAL FRONTIER. Need an excuse to feel miserable? Read “Leonard Nimoy Died Hating William Shatner” at About Entertainment. (12) CULTURAL APPROPRIATION DEBATE. Kaitlyn Greenidge makes some trenchant comments in “Who Gets To Write What?” for the New York Times. …Claudia Rankine, when awarded the MacArthur genius grant this past week, noted that the prize was “the culture saying: We have an investment in dismantling white dominance in our culture. If you’re trying to do that, we’re going to help you.” For some, this sounds exciting. For others, this reads as a threat — at best, a suggestion to catch up and engage with a subject, race, that for a long time has been thought of as not “universal,” not “deep” enough for fiction. The panic around all of this is driving these outbursts. It must feel like a reversal of fate to those who have not been paying attention. The other, who has been relegated to the background character, wise outcast, dash of magic, or terror or cool or symbolism, or more simply emotional or physical whore, is expected to be the main event, and some writers suspect that they may not be up for that challenge. A writer has the right to inhabit any character she pleases — she’s always had it and will continue to have it. The complaint seems to be less that some people ask writers to think about cultural appropriation, and more that a writer wishes her work not to be critiqued for doing so, that instead she get a gold star for trying. This debate, or rather, this level of the debate, is had over and over again, primarily because of an unwillingness on one side to consider history or even entertain a long line of arguments in response. Instead, what often happens is a writer or artist acts as though she is taking some brave stand by declaring to be against political correctness. As if our entire culture is not already centered on a very particular version of whiteness that many white people don’t even inhabit anymore. And so, someone makes a comment or a statement without nuance or sense of history, only with an implicit insistence that writing and publishing magically exist outside the structures of power that dominate every other aspect of our daily lives. Imagine the better, stronger fiction that could be produced if writers took this challenge to stretch and grow one’s imagination, to afford the same depth of humanity and interest and nuance to characters who look like them as characters who don’t, to take those stories seriously and actually think about power when writing — how much further fiction could go as an art. (13) THE VOX DAY FASHION SHOW. 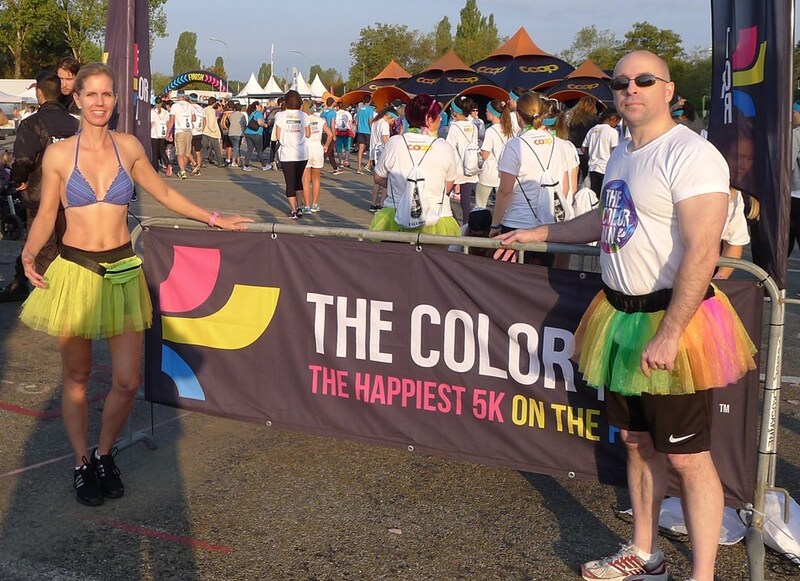 Day spared no effort to fit into the theme of a 5K he ran — “The Color Run: a story of courage, endurance, and ninjas, part I”. We got up very early, so early that it was pretty much a toss of the coin as to whether I’d just stay up all night or not, and made the drive to Lausanne, Switzerland, where we met our friends with whom we were doing the run. We changed in the parking lot, where it was much appreciated how my multicolored tutu nicely matched the colorful logo of the t-shirts we were provided. It was rather cold, which inspired Spacebunny to deliver an equally colorful soliloquy in appreciation for the generosity of the donors who were the reason she was wearing nothing but a bikini under her tutu. Which, of course, was not as pretty as mine, as hers was only yellow. I pointed out that she would probably be glad to not be wearing very much in the way of clothing once we started running and the sun rose a bit higher in the sky, an intelligent observation that impressed her to such an extent that she expressed a keen wish to feel my teeth in her flesh, a sentiment that she managed to phrase in an admirably succinct manner. She was also delighted to discover that while there were people wearing everything from unicorn suits to dragon outfits, she was the only runner in a bikini. (14) REAL NEWS AND A FAKE TRAILER. From Den of Geek, “Doctor Who Spinoff: Class – Latest News”. Peter Capaldi will be appearing in the first episode of Class! The show announced the good news via its social media accounts. We also know that the show’s first two episodes will premiere in the UK on October 22nd. The Twitter account also announced the titles of the first two episodes: “For Tonight We Might Die” and “The Coach With the Dragon Tattoo.” Whoa. That first one is dark and that second one really does sound like it could be a Buffy episode…. Sadly, we don’t yet have an official trailer for Class, though we do have an amazing fanmade one that is pretty brilliant in showing a potential tone of the show and put it into context within the larger Doctor Who universe. It gives a sense of just how ingrained the Coal Hill School has been in the Doctor Who world.